One would think that a neoliberal regime, especially if it were authoritarian and repressive, would be just the ticket to curry favour with Washington. Second highest economic growth rates and most stable economy in Central America. Reaching the UN Millennium Development Goal of cutting malnutrition by half. Free basic healthcare and education. Illiteracy virtually eliminated, down from 36% in 2006. Did not contribute to the migrant exodus to the US, unlike neighbouring Honduras, El Salvador, and Guatemala. Unlike its neighbours, kept out the drug cartels and pioneered community policing. The World Bank, IMF, and EU countries have certified Nicaragua for its effective use of international loans and grants. Funds were spent for the purposes they were given, not syphoned off into corruption. Before April 18, Nicaragua was among the most peaceful and stable countries in the region. The otherwise inexplicable violence that has suddenly engulfed Nicaragua should be understood in the context of it being targeted by the US for regime change. Nicaragua has provoked the ire of the US for the good things it’s done, not the bad. Besides being a “threat” of a good example, Nicaragua is in the anti-imperialist ALBA alliance with Venezuela, Bolivia, Cuba, and others. The attack on Nicaragua is part of a larger strategy by the US to tear apart regional alliances of resistance to the empire. Nicaragua regularly votes against the US in international forums such as challenging retrograde US policies on climate change. An inter-ocean canal through Nicaragua is being considered, which would contend with the Panama Canal. Russia and China invest in Nicaragua, competing with US capital. The NICA Act, passed by the US House of Representatives and now before the Senate, would initiate economic warfare designed to attack living conditions in Nicaragua through economic sanctions, as well as intensify US intelligence intervention. The ultimate purpose is to depose the democratically-elected Ortega government. Meanwhile, USAID announced an additional $1.5 million “to support freedom and democracy in Nicaragua” through non-governmental organizations (NGOs) to overthrow the government and “make this truly a hemisphere of freedom.” That is, freedom for the US empire. Those on the left who also call for Ortega’s removal need to accept responsibility for what comes after. Here the lesson of Libya is instructive, where the replacement of Gadaffi has resulted in a far worse situation for the Libyan people. Any replacement of Ortega would be more, not less, neoliberal, oppressive, and authoritarian. When the Nicaraguan people, held hostage to the US-backed Contra war, first voted Ortega out of office in 1990, the incoming US-backed Violeta Chamorro government brought neoliberal structural adjustment and a moribund economy. “Dictators don’t win fair elections by growing margins,” notes longtime solidarity activist Chuck Kaufman, citing Ortega’s 2006 comeback win with a 38% plurality, followed in 2011 with 63%, and 72.5% in 2016. The Organization of American States officially accompanied and certified the votes. The dissident Sandinistas who splintered off from the official party after the party’s election defeat and formed the MRS (Sandinista Renovation Movement) are not a progressive alternative. They are now comfortably ensconced in US-funded NGOs, regularly making junkets to Washington to pay homage to the likes of Representative Iliana Ros-Lehtinen and Senator Marco Rubio to lobby in favour of the NICA Act. Nor do they represent a popular force, garnering less than 2% in national elections. When the MRS left the Sandinista party, they took with them almost all those who were better educated, came from more privileged backgrounds, and who spoke English. These formerly left dissidents now turned to the right in their hatred of Ortega, have many ties with North American activists, which explains some of the confusion today over Nicaragua. The world, not just Ortega, has changed since the 1980s when the Soviet Union and its allies served as a countervailing force to US bullying. What was possible then is not the same in today’s more constrained international arena. Nicaragua is the most progressive country in Central America with no close rival. There is a disconnect between urging Nicaraguans to replace Ortega with new elections and advocacy against US imperialist depredations. Unconstitutional elections in Nicaragua would further destabilize a profoundly destabilized situation. Given the unpopularity and disunity of the opposition and the unity and organizational strength of the Sandinistas, Ortega would likely win. Most important, the key role of Northern American solidarity activists is to end US interference in Nicaragua so that the Nicaraguans can solve their own problems. 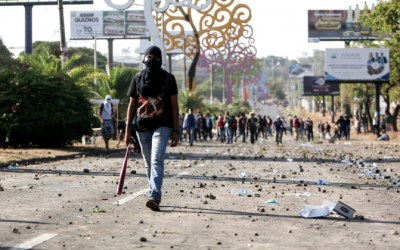 The rightwing violence since April in Nicaragua should be understood as a coup attempt. A significant portion of the Nicaraguan people has rallied around their elected government as seen in the massive demonstrations commemorating the Sandinista revolution on July 19. For now, the rightwing tranques (blockades) have been dismantled and citizens can again freely circulate without being shaken down and threatened. In the aftermath, though, Nicaragua has suffered unacceptable human deaths, massive public property damage, and a wounded economy with the debilitating NICA Act threatening to pass the US Senate. Roger Harris is on the board of the Task Force on the Americas, a 32-year-old anti-imperialist human rights organization.